Imagine that you are completely unbiased and unaware of the college football world. Pretend that you’ve never seen the ranking systems and are unaware of the perceived power of the conferences. Imagine never guessing at how much to move each team up or down each week, with no knowledge of the useless pre-season rankings. I started with this perspective and then devised a computer ranking system based on the power of the conferences as they performed against the other conference during the season. With the emergence of the American conference, and witnessing such a wide range of rankings these teams received, it became utterl­­y clear that the power of the conferences needs to be evaluated. So, I developed a computer model. The former computer models, which were abandoned after the CFP era, used conference strength. The problem with that was that conference strength was based purely on opinion; they were either top 5 or not. They also used metrics like wins against top 25 teams, which was not precise enough, and metrics like strength-of-schedule, which was also subject to opinion and bias. 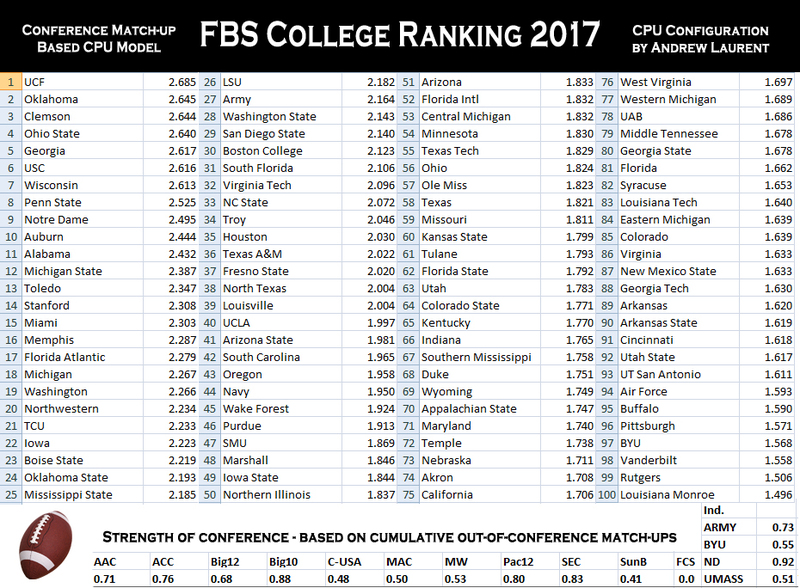 I created this CPU model to first determine the strength of the conferences and then rank the teams using that metric. Here’s how I configured my ranking model. I calculated each team’s record within their conference. I considered their record within their half of their division. I then took their record in the other half of the division and weighed it by the division record of those teams. I also considered the combined record of games played cross-division within a conference to see how much better one division was than the other. I used this to further weigh the teams in each division. I did this because it is important to consider how difficult the in-conference schedule weighed on the team’s success and stamina. At this point, all we know is how teams stack up within their own conference. Next, we use these standings and their out-of-conference games to rank the conferences. I calculated the value of each conference’s wins/losses against out-of-conference opponents. I used this in-conference value of a team and compared it to the in-conference value of their non-conference opponents. The sum of these matchups across all teams within a conference determined the value of that conference. Now that a value of the conferences was established I used these values to further adjust the conference rank. I added the value of each conference to each game played against a team in that conference. So, a conference that had more games played against, what we’ve now determined are, the better conferences will receive more value. If Team A (7-1) from Conference A and played Team B (3-6) from Conference B, then Team A gets the difference divided by 2 subtracted from the result. Team A gets -.27 added to the win (1) or loss (0). Team B gets .27 added to the result. If Conference A had a conference value of .48 then every team that played out-of-conference game against that conference get a .24 boost to their conference value. This sum of these boosted values divided by the number of games is added to determine the conference’s final adjusted conference value. These final adjusted conference values will be used to rank the teams in several ways. There are two distinct values: in-conference and out-of-conference. First, I calculated a team’s non-conference win/loss percent. I applied their opponents’ in-conference values. I then added the value of their opponents’ conferences, divided by 1.67. This determined the out-of-conference value, which I then weighed so that it was 1/3 of the average final value of the teams; the other 2/3 comes from the in-conference value. For the in-conference value, I took a team’s value of their own conference divided by 1.67 and added the team’s own value within their conference. Lastly, I gave conference champions a bonus; ¼ of their conference’s value was added to the champ’s total value. The loser of the championship gets no bonus or penalty. I considered giving an undefeated bonus of .1 but decided things like that and Clemson’s unfortunate loss, due to injury, could be weighed by the user to determine if they think it should put them into the playoff over another team. Teams play a different number of conference games and out-of-conference games, some due to natural disasters. I first found the value of their conference record and then out-of-conference record. The average value of a team’s out-of-conference games was about the same as the value of their conference games. So, I weighed down the out-of-conference value to make it roughly a third of total value. Since most teams play 1/3 of their schedule out-of-conference this gives as much credence to both conference and non-conference play. This way, out-of-conference games become just slightly more important for teams that play less out-of-conference games. While teams get added value for the teams and conferences they play against in the FBS, there is no added value for games against FCS teams. In addition, against FCS schools I valued a win or loss at .5 or -.5 instead of 1 or 0. This prevented skewing the FBS conference strength calculations. Conferences shouldn’t get full credit for beating FCS schools but they still do get some added value based on the opponent’s record. For the division-less conferences, I took each team’s in-conference opponents’ win percentage, weighed it, and added it to their conference record. For the independents, I treated each team like they were their own conference. I used their whole season record. I calculated their opponents’ win percentage and factored the conference rank of every team they played to determine their value. This actually helped in establishing the value of the conferences. Yes, UCF is #1. The American conference outshined the Big 12 and neared the ACC. Everything about their combined out-of-conference games indicates they are a top tier conference. Houston’s win over Arizona wasn’t a fluke and neither was Memphis’ win over UCLA. SMU almost beat TCU; not that close wins matter in this CPU model. Navy beat FAU, who went undefeated in the C-USA. UCF easily beat Maryland, who played decently in the better half of the best conference. Every AAC team beat their “group of 5” opponent except Tulsa. UCF went undefeated, played a decent schedule, and won their conference championship. Notice that all of the top 6 teams got in above Wisconsin only because of the value added from their conference championship. That’s also what got Toledo, FAU, and Boise State into the top 25. It might be surprising to some people that Alabama is at #11. This resulted because they played the worst teams in the Eastern Division of the SEC and their win against FSU wasn’t very valuable. Compared to Auburn, Alabama got more points out-of-conference but the more important in-conference schedule weighed them down. Some might say that Alabama would have beaten better teams in the East or out-of-conference if they had faced them, but they don’t deserve credit for what might have happened. If you face weak teams you better make sure you go undefeated. Notice USF. Their schedule was so weak in the Western Division and out-of-conference that even if they went undefeated they wouldn’t have made it into the playoff. Clearly, there isn’t a bias for the American Conference in this CPU model with USF down at #31. They’re currently ranked top 25 in national polls because they started the season ranked. They’re a great team that could compete for a national title but they would never have deserved a spot with their poor schedule. Look at how low teams like Iowa State, Syracuse, and Pittsburgh sit. While they beat top 25 teams within their conference, this fact doesn’t matter in this ranking model. Within own division play, what matters is your record not who you beat. Everyone plays everyone in their own division. You can’t lose out to the middle and poor teams within your own division, but then beat the top team and expect a huge jump in the ranking. This is because, in one division, every team’s combined record of opponents within the division would be the same. Instead, they already get added value for having great teams in their division. Now, if a weak team upsets a top team cross-division then that would make an impact on their in-conference value and the value of their half of the division. Teams in a division-less conference, like Sun Belt, would get more of a bump for this sort of win too. This is because not everyone plays everyone in the Sun Belt. Now, a three-loss Notre Dame above Alabama might seem extreme too but Notre Dame had the toughest schedule in the FBS. They also don’t have the weight of a conference holding them down. This can work against independents too if they have a weak schedule. The reason Penn State was above Ohio State was mostly that Ohio State played weaker opponents in the other half of the division. While this hurt them before championship week, facing easier teams could have contributed to why they got into the championship. It would be difficult, with this ranking system, for a non-conference champion to get into the playoff over another team like Penn State or Wisconsin. Yes, there’s no SEC team in the playoff. Everything went wrong at the end of the season for the top teams in this conference. Yes, Georgia only had one loss, in-conference, and their schedule was tough. The problem was that the Eastern division in the SEC was awful this year. That isn’t weighted very heavy but it was just enough to keep them below other conference champions. Even the value boost from winning the 2nd best conference wasn’t enough. If Auburn had won the championship they would have jumped over other conference champions Clemson and Oklahoma and into #2. Few people had Wisconsin ranked so high, and reasonably so. They didn’t have a tough schedule compared to the rest of the top 10. They did get value for playing FAU that went undefeated in their conference, but no more than would they have playing a mid level ACC team. The reason for their #1 rank, pre-championship week, is that it’s difficult to devalue wins. There’s a point in which if you devalue a win too much, the poorly valued team that lost ends up getting more credit for a loss than the high valued team gets for a win. I straddled this line with the valuations. It’s why I divided the difference between the teams’ in-conference records and the value of their conference by 2. Even though Wisconsin didn’t play the tougher teams in the East Division, the West surprisingly didn’t do that badly overall against the East. The Big10 was very good this year; they were 16% better than the ACC and 29% better than the Big12. In conclusion, I wasn’t sure what to expect using this completely unbiased ranking system. The results were insightful and fair. Currently, championships in college football depend on pre-season rankings but the last two seasons have shown that preliminary rankings are hilariously inaccurate. There needs to be a more reliable method to rank teams in this billion dollar marketplace. Some NFL fans despise college football solely because of the difficulty ranking teams across so many conferences. We’ve all seen how, at times, the professionals voting can be extremely arbitrary or downright spiteful. The polls are archaic. Without a total overhaul of the conferences or scheduling, this model I’ve developed is the best approach to ranking the teams imaginable. I urge the playoff committee to consider taking this approach in future years. With this model, there’s no need to release CFP rankings until the end of the regular season and again the week after conference championships. This intricate CPU model would be difficult to maintain every week of the season. It would change drastically each week because if one team drops then all relative teams drop. It’s possible to run it all season long but it wouldn’t be worthwhile unless properly funded. It would benefit the NCAA to put more emphasis on conference play by using this model. As a side note, if teams played all their conference games first and then waited to schedule their out-of-conference games until the end of the conference play, it would make the experience more enjoyable for fans and it would play well into this accurate and precise CPU model I’ve developed.